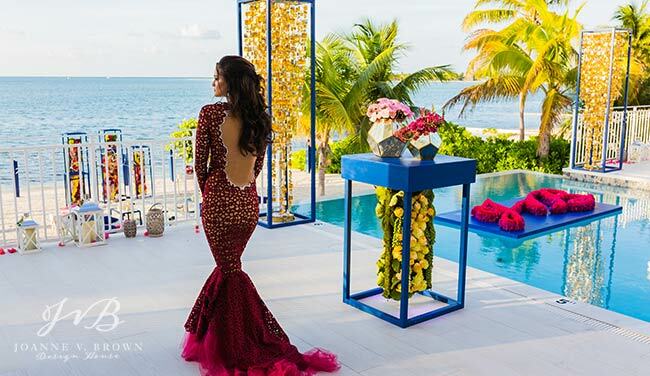 This stylized shoot is the finale in a trio of shoots to celebrate the partnership between Luxury Cayman Villas, JVB Design House, and Celebrations Ltd. to promote destination weddings in the Cayman Islands. 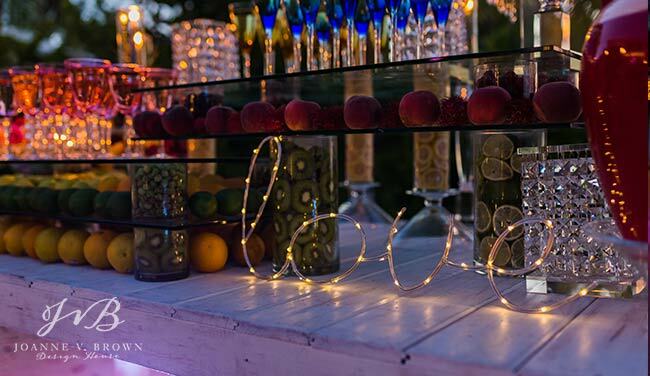 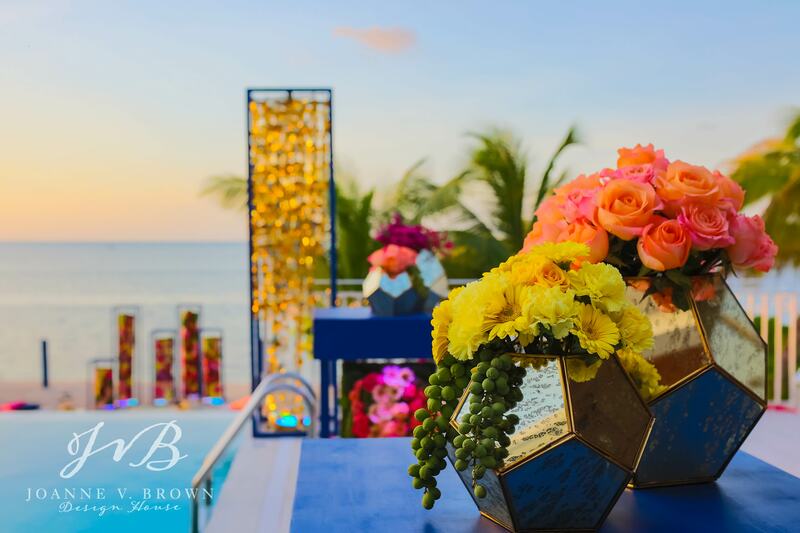 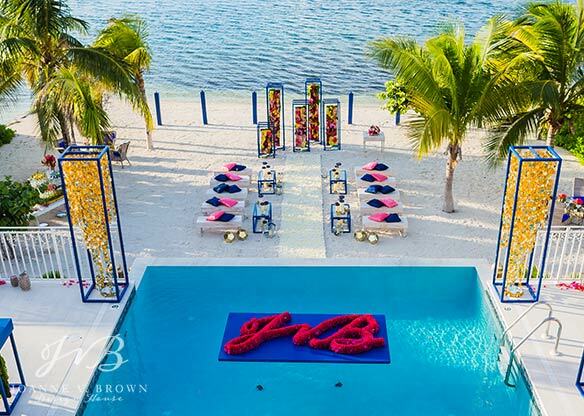 The decor design is part of the new collection of designs by JoAnne Brown’s JVB Design House, a design-focused sister company of Celebrations Ltd. specializing in weddings throughout the Caribbean. 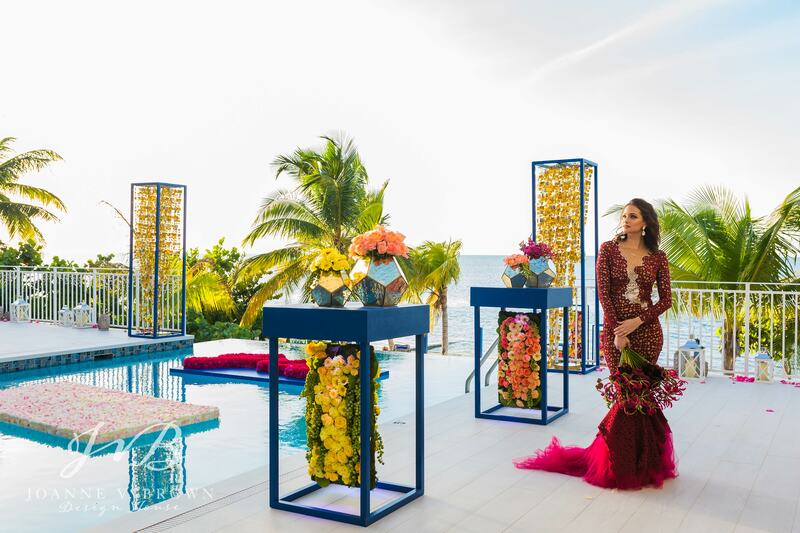 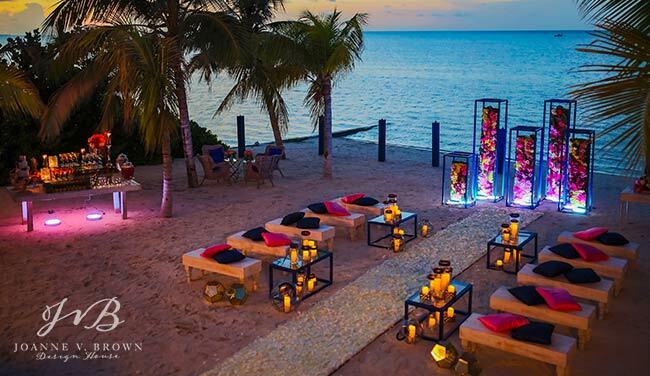 Using a color palette of Navy and Marsala complimented by tones of citrus, the design was inspired by the romance of Caribbean destination weddings and the modern architecture of LCV’s collection of private villas. 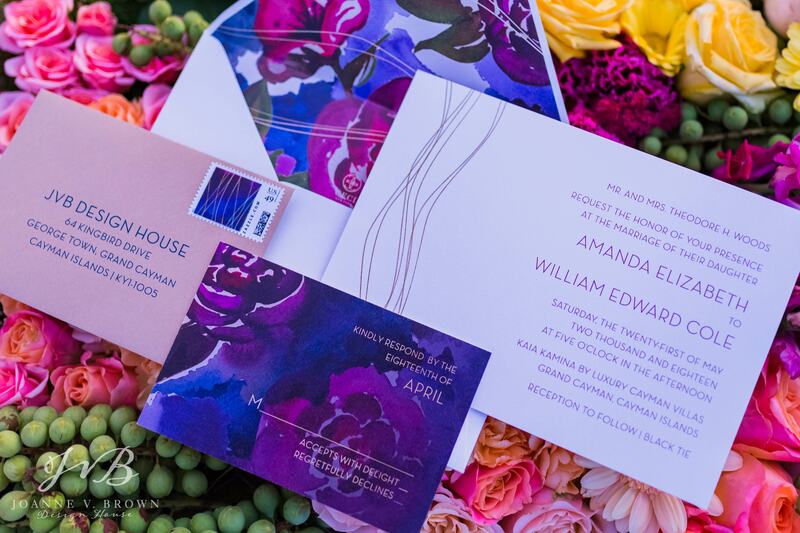 Our lovely and talented friends at Ceci New York designed a stunning watercolor invitation suite to accompany the decor, featuring the colors of the design with beautiful gilded gold detail. 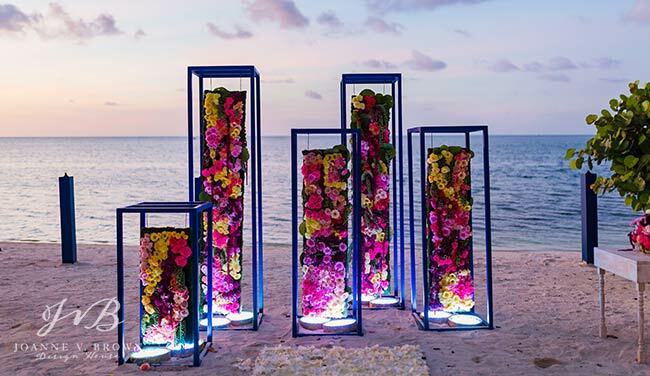 These vibrant panels combined an array of beautiful flowers delicately applied to moss panels and accented with local greens such as cascading seagrapes were hinged to the custom built cocktail tables to dress up the tables with feminine detail. 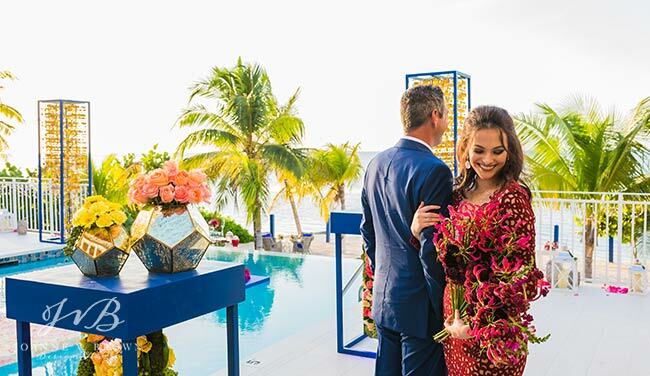 The pool at Kaia Kamina villa wasa absolutely stunning, overlooking the ocean, the inifiti pool ws the perfect space to add a signature decor piece. 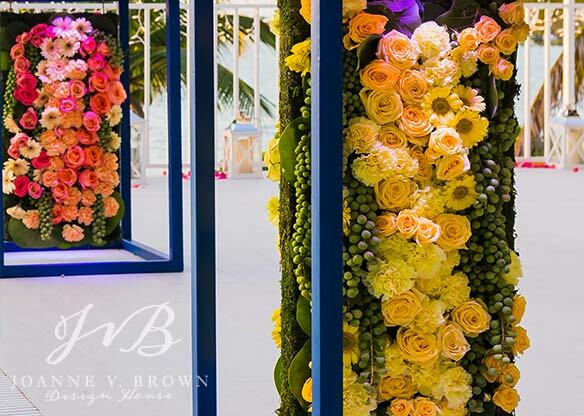 We created an oversized 'JVB' logo using deep pink floral such as local bougainvilla. 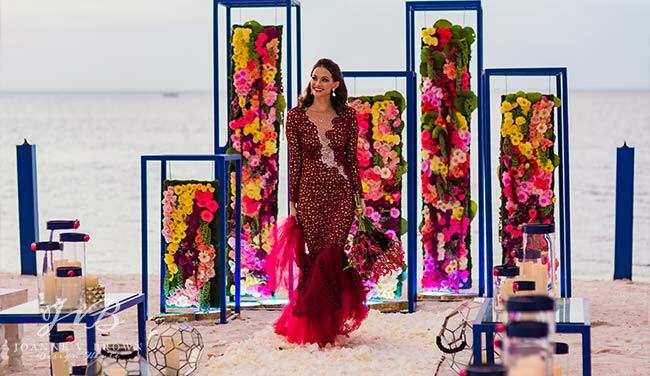 A marsala colored fan-style bouquet of gloriosa and ranunculus' was modeled by our beautiful bride to compliment the showstopping gown by local designer, Kenzie Rose. 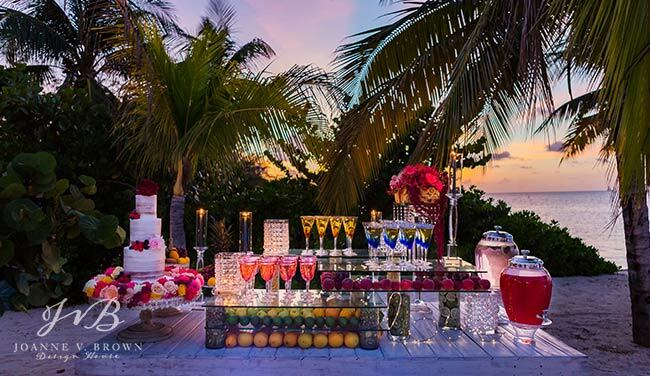 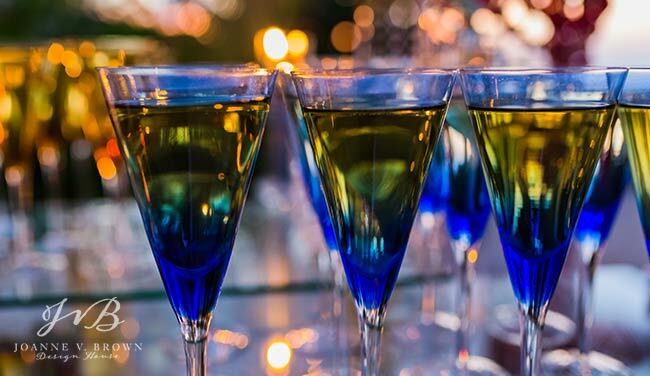 To compliment the vibrant shoot, we incorporated a refreshment station that was as tantalizing to look at as to taste. 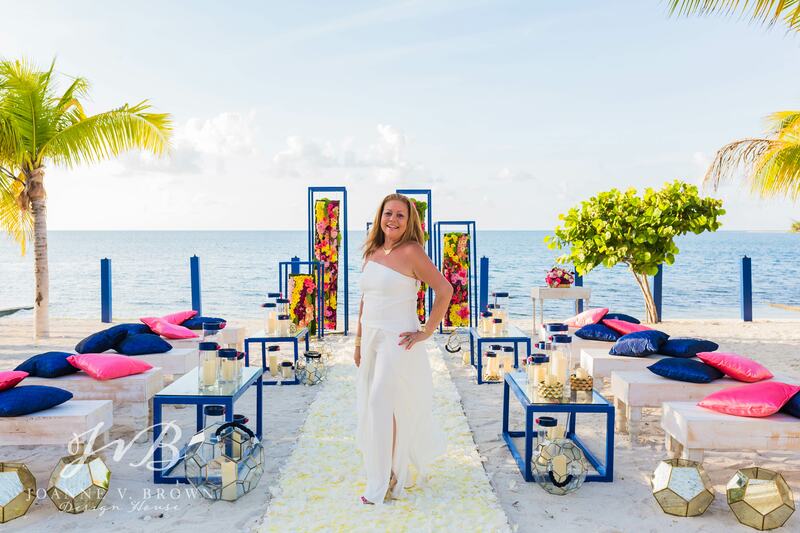 Using a white-washed table base kept the design perfectly beach appropriate and the vibrant green palms and seagrape trees surrounding the villa made for the perfect backdrop to our citrus themed station. 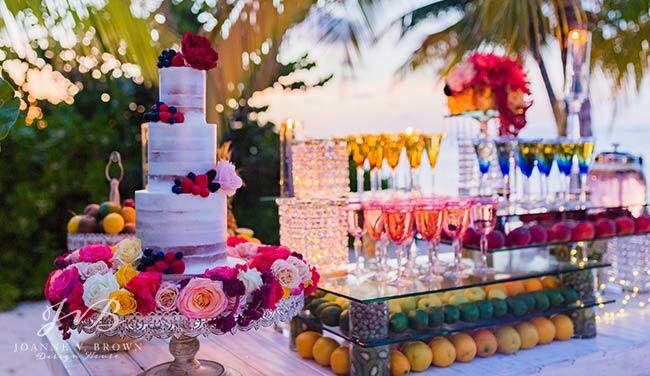 A stunning three-tiered naked cake by The Cake Studio in the Cayman Islands added to the gorgeous display, with accents of berries and a fresh floral adorned cake stand as its showcase. 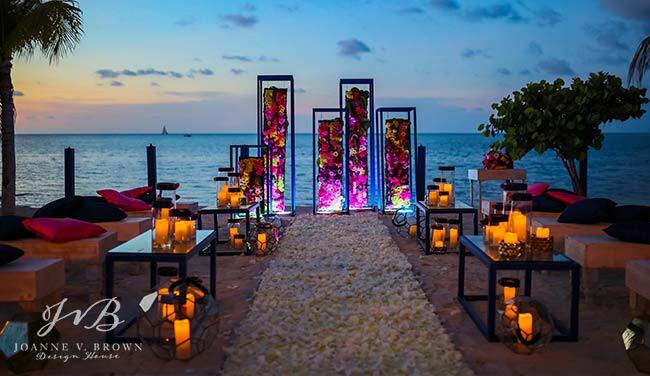 As the evening went on and the sun began to set, the area began to glow in the rich tones of the design. 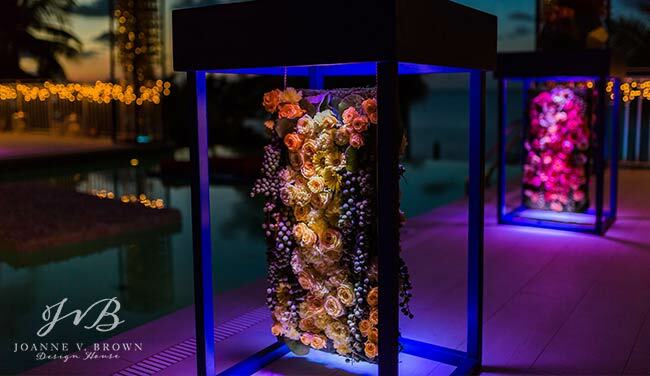 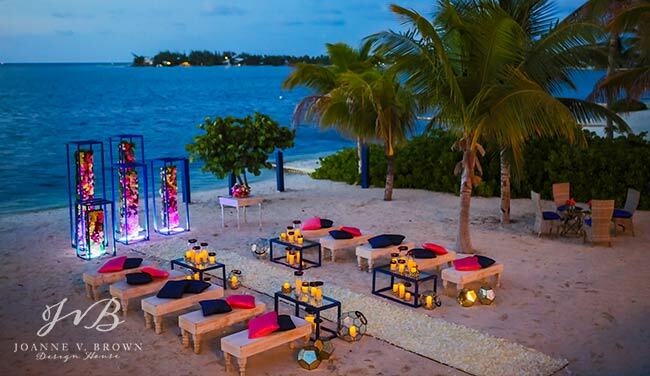 With candlelight detail incorporated throughout, ferry lights spelling out "LOVE" on the refreshment table and spotlights casting a glow on the floral pieces, the entire setting was utterly and romantically illuminated after dark. 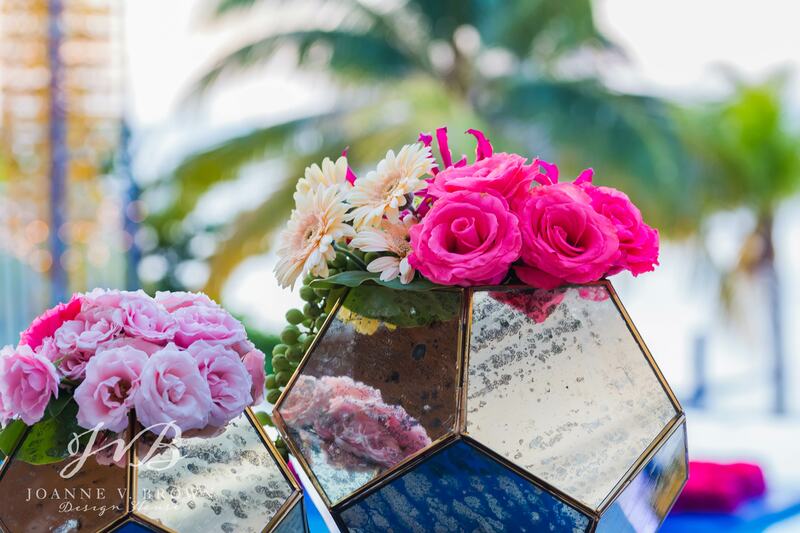 Floral, Production & Décor: Celebrations Ltd.